Fred and Ellen Shimasaki - "Whose America? Who's American?" 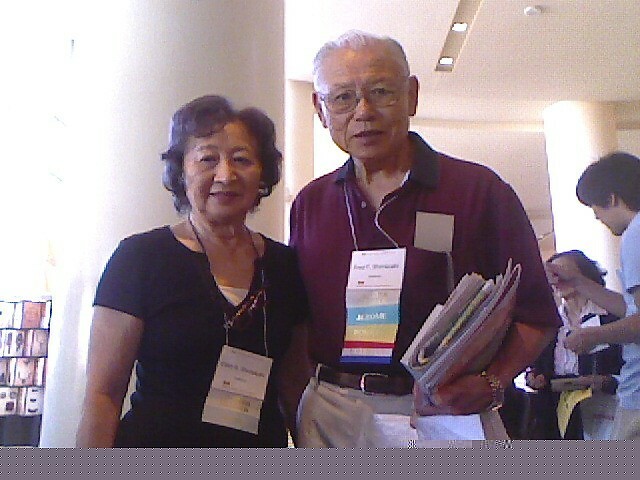 Fred (right) and Ellen (left) Shimasaki (Hayward, California), participants at the "Whose America? Who's American? Diversity, Civil Liberties, and Social Justice" National Conference in Denver, Colorado presented by the Japanese American National Museum. The photo was taken at the Discover Nikkei booth in the Community Marketplace on Friday, July 4, 2008 at the Hyatt Regency, Denver. Came for the reunion with the Topaz High School class of 1945. Also to connect with our Japanese American heritage and to learn more about it. editor — Last modified Mar 30 2011 7:52 p.m.
Tell Us About Your Name! COPANI 2013: "What is Nikkei?"